IBM Pulse 2013 is introducing a new social networking feature called “Pulse on Vivastream,” where you can connect and interact with other attendees and speakers to find people with similar interests and skills, share agendas, discuss hot and trending topics, and network with your peers. 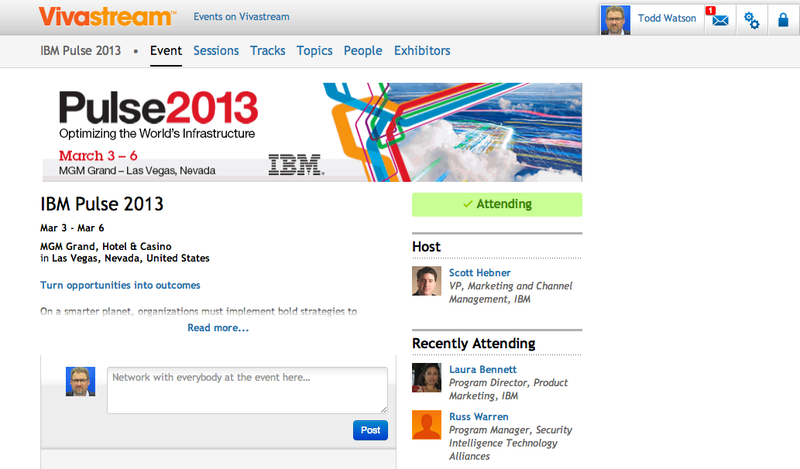 So, sign up now so you can make the most of IBM Pulse 2013 — before, during, and after the event. First it was Ubuntu Linux on phones, and now it looks like it’s going to be Ubuntu Linux on Tablets. TechCrunch posts that on Thursday, developers will be able to start “playing with” the new code, citing Ubuntu founder and VP Products Mark Shuttleworth saying that the strategy is “One Ubuntu” that contains the same codebase but works across multiple platforms, including desktops, phones, and tablets. But, that each platform “uses a Linux kernel” that’s tailored for the specifics of the target hardware. This in juxtaposition with iOS and Android, which don’t work as well beyond the handset form factor. For the record, I currently run Ubuntu on several of my older machines, and save for some VPN woes, I’m a (mostly) happy Ubuntu user. But what’s more interesting to me about this announcement is the timing. The global mobile confab, Mobile World Congress, is set to launch next week in Barcelona (one of my favorite cities on the planet!). I expect you’ll hear more about IBM’s mobile strategy in Barcelona, and shortly thereafter at the IBM Pulse event in Las Vegas, which I’ll be covering for Big Blue. If you’re planning on attending IBM Pulse, I would highly recommend you start preparing your schedule now. Already-registered attendees simply need go to the Pulse SmartSite to start checking out this year’s fare. This year, IBM has introduced an exciting new social feature in the form of Pulse on Vivastream, a unique social networking platform where you can connect and interact with other attendees and speakers in advance of, during, and after the event to find people with similar interests and skills, share agendas, discuss hot and trending topics, and network with other attendees before you ever land in the land of what happens there stays there. I’m already registered on “Pulse on Vivastream” myself, so feel free to drop by and introduce yourself. This year, IBM Pulse guest speakers and performers include 4-time NFL MVP quarterback Peyton Manning and 6-time Grammy Award winner Carrie Underwood. You’ll also have the opportunity to mix it up with 8,000+ of your peers and hear from IBM business partners and top industry analysts on the latest trends and hottest IT topics…including, yes, mobile. You can go here to learn more about IBM Pulse 2013, which goes from March 3-6. I’ll be bringing you more insights and coverage leading up to and during the event right here in the Turbo blog, and will once again be broadcasting via the Interwebs from the show floor, speaking with a variety of IBM executives, industry analysts, and other thought leaders that help make the IBM Tivoli world go round.